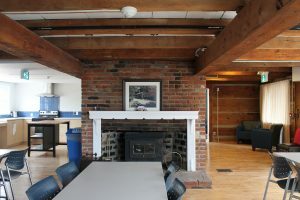 In the fall of 2014, York University and Office of the Vice President Academic & Provost hosted an event entitled “Making the University a more Hospitable Space for Indigenous scholars, students and staff.” Provost Rhonda Lenton announced that Hart House would be renovated and become a space on campus to host and support Indigenous students, Indigenous staff and faculty. The office of the Vice-President Academic & Provost, the Office of the Vice-President Finance and Administration, and Osgoode Hall Law School generously provided the funds for this project. The renovations are completed and CASS will be administering the site. On June 21 2017, the University announced the renaming of the building Skennen'kó:wa Gamig. Skennen’kó:wa Gamig will serve in a number of functions including providing a safe cultural space on campus for formal and informal use by Indigenous students, staff and faculty. In addition to casual congregating, student groups will use the facility for a range of activities including Elder events, workshops and meetings. CASS will use the space to support cultural programs including Elder events, workshops, and teachings. Faculty members will use the space for Indigenous related teaching, speaker series, and Indigenous graduation receptions. The capacity is restricted to 29.